While at an estate sale, I was slowly wandering through the house with my hands behind my back, just looking. Estate sales are interesting, a little morbid, and an experience. Most sales happen because the homeowner has died and the heirs employ a company to go into the house, organize, price, and sell everything-even spices from the kitchen and clothes in the closets. Some residents have moved into assisted living, so they are only downsizing, and sometimes they are in the house during the sale. That makes it awkward. I learn a lot about a person by looking at their stuff. Some are hoarders, and I don’t stay long in those houses. I get overwhelmed and feel claustrophobic. I then go home and gather a load of my excess and make a trip to the thrift store. One house had two rooms full of square-dance dresses. They were hanging on large round department store clothing racks. Another house had hundreds of cats: Metal, ceramic, cloth, big, tiny, inside and outside. Then, there was the house with the baby book. What family would not keep Grandpa’s baby book? It was complete with pictures and the arrival dates of every tooth. Seriously? Some homes are beautiful with the finest furnishings and exquisite mementos from world travels. Some have closets big enough to be another bedroom and kitchens equipped for master chefs. The dishes, stemware and serving dishes are elegant. And then, there is jewelry. I can spend hours at those sales, and go back the next day. The sales usually last three days, and the last day is my favorite because everything is half price. Those are the days I purchase. I have different taste than most people so what I wanted on the first day is usually still there waiting to be loved by its new owner, me. Back to the beginning of this story. 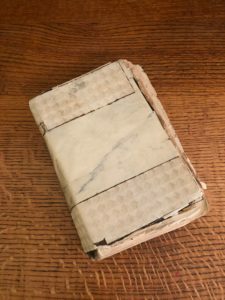 I was wandering through the office of an estate sale house, and on an oak antique roll-top desk laid a book with a handmade paper cover. I opened it to see pages unattached to the binding. It was a Bible. 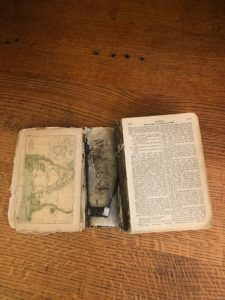 It was a used and lovingly abused Bible. I found myself gently touching it as if it was alive. I regret not buying the Bible. I hope it didn’t end up in a landfill. At the time, I felt it would be disrespectful for me, a stranger, to take it from its home . I took pictures, touched the fragile pages one last time, and replaced the cover. 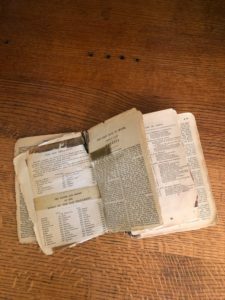 The little Bible is one of my sweetest estate sale memories. When people wander through my house after I die, what will they know about what I value? What will they want? What will not sell but be boxed up and taken to a non-profit? Estate sales help me think about how death can be as telling as life, and the sweet little loved Bible told a story all by itself. Beautiful and touching story Jennifer. SO good to see you the other nite at the Briarwood! It was so good to see you too, Geri. Crazy how busy we can get and stay even after we give up a 7-5 job. Thanks, as always, for the follow and kind words.